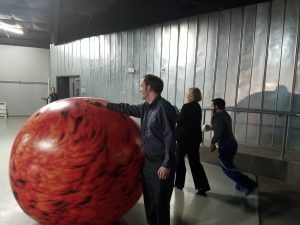 Orbit Earth Expo Visits High Point Academy! 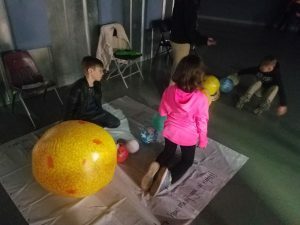 SPARTANBURG, SOUTH CAROLINA – High Point Academy welcomed Orbit Earth Expo, SparkPoint’s in-house astronomy experience for the school day and a Family STEAM Night! The Blue Auditorium was perfect – super dark! – for creating the shadows necessary to comprehend how the phases of the moon and eclipses are formed. What fun! The K-4th grade students had a great time manipulating the 14′ earth and scale-sized moon models. The school’s STEAM Night from 6pm – 8pm was a blast! 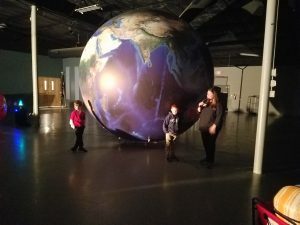 Families participated in stations demonstrating the seasons, moon phases, the orbits of the earth and moon around the sun, rotation of the earth/selfie station, art station, a planet challenge (identify the planets and put them in order), and the solar system video. Thank you so much for having us out! Your students are out of this world!